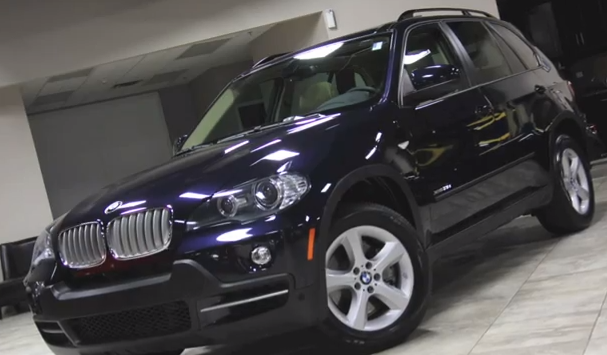 Take a ride in the advanced technology turbo-diesel BMW X5 xDrive 35d with Chris Moran from Chicago Motor Cars. This is one hot ride! There’s love at first sight, and then sometimes it can take a second. With this diesel BMW X5, it was the latter, since that’s the amount of time required to overcome the lag of the twin-turbo setup and for the big ute to go from a standstill to full-bore acceleration. But the turbo lag we mention might be more specifically described as big-turbo lag. Unlike the equal-size twin turbos on BMW’s gas six- and eight-cylinder engines, the inline-six diesel—a newly available engine option for 2009—uses two differently sized turbos in an attempt to minimize lag. The smaller turbo spools up first, when exhaust flow is minimal, and the larger one takes over once exhaust flow is sufficient to spin it. Once the turbos do their thing, the 3.0-liter inline-six produces the same 265 hp and 425 lb-ft of torque in the X5 diesel as it does in the much lighter 335d and is paired, as it is there, with a six-speed automatic transmission. The test numbers show that our impatience was unwarranted, as the X5 sprinted to 60 mph in a relatively sprightly 6.8 seconds. Compared with its gas-burning siblings, it’s closer to the time of the V-8 X5 xDrive48i (6.1 seconds) than the inline-six X5 xDrive30i (7.8). As you’d expect, fuel economy was improved; we got 20 mpg in the diesel versus 18 in the gas six-cylinder and 14 in the V-8. And unlike the last time we tested an oil-burning BMW, diesel fuel is cheaper than gas, at least for now. Our time in BMW’s biggest diesel offering included a trip across the palm of Michigan’s mitten. All the torque meant that passing power was predictably prodigious, and the transmission was smooth and always chose the right gear. We enjoyed the well-designed interior that we’ve become accustomed to via a long-term relationship with our X6 xDrive50i—the X6 and the X5 share most of their interior components and styling. The rest of the experience is familiar to anyone who has been in an X5 or X6, so that means a pampering ride, good forward visibility, and BMW’s typically wonderful dynamics. Plus, this Bimmer had the cleanest carpets we’ve ever seen in a press car. The price came to $68,520, which included a whopping $15,000-plus in options. Aside from the aforementioned lag, some very minor diesel clatter, and the “d” at the end of the unnecessarily long xDrive35d badge, it’s tough to tell this X5 apart from the gas swillers. The X5 xDrive35d adds a little under $4000 to the 3.0-liter gas X5’s sticker, and the models are equipped essentially identically. Four grand sounds like a lot—although that’s somewhat offset by an $1800 tax credit—especially when it could take a long time for any fuel-cost saving to recover the extra initial outlay. But then you think about the diesel’s extra swiftness, mountains of torque, long range, and pseudo-green cred, and you find yourself understanding the unique appeal of an oil burner.